Matthew: I see this episode as a "message show," in the fine tradition of other message shows in Trek, such as "The Ultimate Computer" (mechanization displacing human labor) and"Symbiosis" (drug addiction as a means of social control). Sometimes these shows work, sometimes they don't. Here, I take the message as one about the phenomenon of PTSD, its effect on families and its attendant risk of suicide. I think, as far as that goes, this was a good look at it. Chief O'Brien exhibited flashbacks, emotional numbness as well as outbursts, social impairment, and so on, all of which are accepted criteria for the disorder. His suicidal thoughts were handled well, and the way Bashir talked him down was a good moment for that character, too. Kevin: I think what I appreciated the most about this part of the story was how credibly it was portrayed. All of O'Brien's reactions are textbook examples of PTSD, and they really create a building sense of tension. The result is that the final scene is well earned and not merely melodramatic. There's a real sense of something breaking, and the resulting drama is compelling. I really liked watching everyone respond. The range of sympathy and gentle confrontation to pulling away also read as organic. An episode this puts me in mind is Chain of Command. The prison term was designed to break O'Brien the way Madred's torture was Picard. What really got me was how they managed to tie O'Brien's torture into the larger Star Trek story. When he declares that he's not the human being that his Federation upbringing teaches he is, the writers manage to make the crisis both intimate and broad. It's a theme they'll revisit in "Siege of AR-558." Matthew: As far as science fiction goes, this is a combo of "Ex Post Facto" and "The Inner Light," but it focuses solely on the aftermath, whereas those episodes focused either on mystery elements or on past history. As such, it didn't feel flatly repetitive. The concept of simulating a long passage of time in mere moments is certainly provocative, and I think it could be used as more than just a punishment. Think of the aphrodisiac, educational, or therapeutic purposes such a technology could be put to. The sci-fi conceit allows for a really interesting flashback structure, and gives us the interesting unreliable narrator aspect of the story, since we can see what O'Brien leaves out. Kevin: I like that they clarified the mechanism of the false memories. These were not merely upload piece of information, but actually an accelerated experience of the memories. Given the cut and paste jobs we've seen elsewhere with memories, it's a good catch, and actually makes the punishment worse. In any meaningful way, he really did experience the prison, not merely falsely remember doing so. 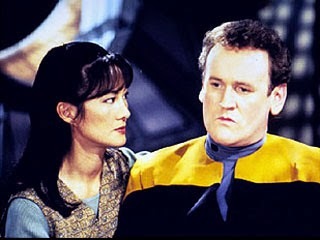 Matthew: I think the time has come to ask: why does O'Brien ever leave the station? One would think he and Keiko might just retire to Earth after this series of misadventures, maladies and disasters. He's gotten the plague, been sentenced to death, been replicated and asked to let the relicant sleep with his wife, been killed multiple times by space rays from a Romulan vessel, and now been mentally saddled with decades of prison time. Factoring these things in with his wife's constant absence for career reasons, I guess the life of an enlisted man is really rewarding to justify sticking around. I just wonder whether a different character might have been a better focus, such as Bashir. Either way, we learn a lot about O'Brien. The upshot of story was that the ultimate punishment for O'Brien was reducing him to a violent animal, similar to his hatred for the Cardassians in "The Wounded." By the way, all this talk of counselor Telnorri really had me wanting to meet him. Kevin: If I had my druthers and could write a script for the show, it would be Keiko giving him an ultimatum: she is leaving for Earth whether or not he comes with. That would have been an interesting episode. Anyway, like I said above, I really liked watching Keiko and Molly react to Miles. She loves him, but she's not responsible for just his well being. Matthew: Look. Colm Meaney nearly always receives and deserves our effusive praise. But this performance is a cut above. His collecting of the food was so sad, as if it had been rehearsed a thousand times, done nearly unconsciously. His anger work was terrific, and really read like PTSD. His interactions with Molly were very raw and real, and his suicide scene was painfully realistic. His prison work was great too, slipping into a deeper accent, seeming very physically beaten. He did a great job of appearing sleep deprived. It was really a tour de force all around. Kevin: It's almost a joke how much they beat up on this guy, but when he turns in performances like this, how can you blame them? Once again lamenting Trek's lack of acting hardware.... If that final scene with the tears and palbable sense of loss were delivered on any other Paramount soundstage, Colm Meany would have an Emmy sitting above his fireplace right now. A lesser actor would have gone for shouting too easily or loudly, but he really infused it with a sense of being broken. Matthew: Rosalind Chao was wonderful, finally being given a role on DS9 where she's not kind of a shrew. She seemed supportive and caring but also justifiably wary. Alexander Siddig gets another good Doctor role here. He really plays concerned well. Craig Wasson was excellent as Ee'Char. He was just a bit annoying, but was totally believable as someone who had come up with strategies to survive incarceration. Kevin: I liked the pitch of Ee'Char's chipperness. His equanimity is another turn of the screw in O'Brien's loss of his sense of self. He has to watch someone who has apparently adapted where he can't. I agree with what you said about both Chao and Siddig. Matthew: I really liked the prison set, with rocks jutting out against structural supports. It's one of the better "cave" sets we've seen, and kind of reminds me of "The Cage." The rest of the show is really a bottle show. The cargo bay had a neat weapons locker for the phasers, (and I like the LEDs on the phaser) but the containers should have been filled with something to give them weight when they were knocked over in O'Brien's fit of anger. Kevin: The prison set was really well done, and I really liked the patterns in the sand. Not only is this a bottle show, but a really effectively done one. There's a sense of claustrophobia in a lot of scenes, especially when Bashir and O'Brien are in the Jeffries tube. Matthew: Makeup and costume were really standouts on O'Brien. The aging effects were believable, and he looked really haggard upon his return. The makeup on Ee'char's arm missing in the suicide scene, though. Kevin: I have to say I think they got a leg up with Colm Meany's cherubic Irish features. Looking up a current picture...and yep...same cherubic features, just some deepend lines. It lets them avoid the pitfalls of pounds of wrinkled latex. That's not to diminish what they did do. He hair and beard in particular looked really old and dirty. Matthew: It's hard to argue against a 5 given the emotional impact of the show. Any nitpicks about O'Brien's overall "whipping boy" arc on the show are not knocks on this episode. It is well written, impeccably acted, and has good production values. A definite highlight. Kevin: I agree wholeheartedly with the 5 for a total of 10. The acting is a notch above, even for typically good actors like Meany and Chao. The story is one of my favorite kinds of effective use of a science fiction idea. It spurs my imagination, but does overwhelm, and in fact beautifully supports a powerful emotional story. So I had not seen this episode before. Really good, and also great podcast. Now that being said I was reading on memory alpha that a similar episode was written in which Sito Jaxa is discovered to actually be alive but in prison. Now that would have been great. After all she is probably in my top three all time favorite TNG babe list. We discussed that when we reviewed Lower Decks, and I think it would have taken the punch out of the episode. Sometimes, the bad thing just happens and there isn't a last minute way out of it. As much as I liked Jaxa as a character, and Shannon Fill did a great job, the dramatic meat of that story is watching these young officers deal for the first time with something the senior crew has had to do far more often, lose a friend in the line of service.